In 1928, the U.S. Congress authorized the Boulder Canyon Project, later known as Hoover Dam. The project's success helped usher several decades of major water projects funded by the U.S. government. Hoover Dam is located on the border between Arizona and Nevada. It is within Black Canyon on the Colorado River, near Las Vegas. The construction of Hoover Dam began in 1931. When completed in 1936, the dam was a major engineering achievement at a height of 221 meters (726 feet) and crest-width of 379 meters (1,244 feet). The reservoir that formed behind the dam is Lake Mead, one of the world's largest artificially created bodies of water. It covers an area of 603 square kilometers (233 square miles), and its shoreline measures 885 kilometers (550 miles). The hydroelectric generators of Hoover Dam—capable of supplying nearly 1.5 million kilowatts of power—provide electricity to Arizona, southern California, and Nevada. Before the construction could start, the Colorado River had to be diverted through tunnels. These tunnels would allow the water to bypass the site of the dam foundation, and later would contain the electric plant generators. Building tunnels directly through the canyon rock walls required huge amounts of dynamite in order to remove rock, and enormous support structures to maintain the passageways. Once the first two tunnels where in place, cofferdams were built to divert the Colorado River. This accomplishment signaled that the actual dam construction could begin. Increasing demands for water in the twentieth century led to some of the largest construction projects ever undertaken. The massive undertaking that created Hoover Dam captivated the public. 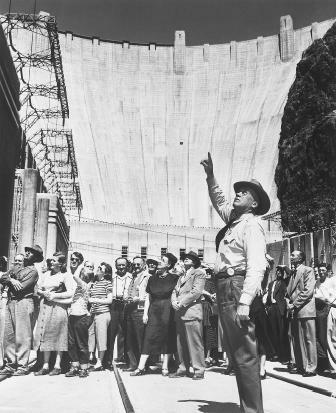 Here a tour guide explains the dam's features to sightseeing visitors in 1949. Hoover Dam remains a popular tourist attraction. reach bedrock , sometimes over 12 meters (40 feet) below. At the same time, workers called "high scalers" blasted the walls to create a smooth joining surface for the dam. On June 6, 1933, the pouring of concrete began at the dam's base. Two-hundred-thirty blocks of concrete, totaling a volume of 2.49 million cubic meters (3.25 million cubic yards), were used to complete the base on May 29, 1935. This pouring process was necessary to allow the concrete to properly dry. It was stated that enough concrete was used to pave a 4.9-meter (16-foot) wide highway from San Francisco to New York City. The filling of Lake Mead now began. The main reason for building Hoover Dam was to supply the electrical power necessary to transport 4.4 million acre-feet—over a quarter of the Colorado River's average annual flow—to California. Soon, the dam also would supply water to Las Vegas, whose revenue would be used to finance more water projects. Hoover Dam also allowed waterworks along the lower Colorado to be safely constructed and maintained as they operated upstream on a (now) tamely flowing river. Because of Hoover Dam, the Colorado River was controlled for the first time in history. Farmers received a dependable supply of water in Nevada, Arizona, and California. Numerous cities such as Los Angeles, San Diego, and Phoenix were given an inexpensive source of electricity, permitting population growth and industrial development. Hoover Dam also provided for flood control and irrigation . Even prior to its completion however, concerns were expressed over the potential impacts of Hoover Dam on aquatic systems. Research performed in the ensuing years shows that significant changes have occurred to the chemical, physical, and biological processes of associated ecosystems , including declines in species of fish. Hoover Dam dramatically altered the hydrologic regime of the Colorado River, for example. Prior to the 1930s, it carried approximately 125 million tons of suspended sediment to its delta at the head of the Gulf of California. At present, the Colorado River does not discharge either sediment or water to the gulf. SEE ALSO Bureau of Reclamation, U.S. ; Colorado River Basin ; Dams ; Economic Development ; Fish and Wildlife Issues ; Hydroelectric Power ; Instream Water Issues ; Reservoirs, Multipurpose . Stevens, Joseph E. Hoover Dam: An American Adventure. Norman, OK: University of Oklahoma Press, 1988. Hoover Dam: An Engineering Wonder of the World. <http://www.sunsetcities.com/hoover-dam.html> . Hoover Dam—National Historic Landmark. Bureau of Reclamation, U.S. Department of the Interior. <http://www.hooverdam.usbr.gov/> . Simonds, William Joe. "The Boulder Canyon Project: Hoover Dam." Bureau of Reclamation History Program. Bureau of Reclamation, U.S. Department of the Interior. <http://www.usbr.gov/history/hoover.htm> . Construction of the concrete arch-gravity type dam began as part of the Boulder Canyon project. Originally named after President Herbert Hoover, the dam was later called Boulder Dam, but in 1947 its initial name was restored. Regarding your statement about Hoover Dam supplying less expensive electricity: what was that cost and what is it today? Is that 1.5 million kWs per generator or the total of all of them combined? i think it was a great steep in the American history. I was Wondering what Influenced Herbert Hoover to Create Such A Dam of Such Size.